I'm working with a section of music where the right hand (treble clef) plays the same thing twice, but the left hand (bass clef) differs the second time round. Usually I would just rewrite out the second treble part identically, but I was just wondering if there was a special, accepted way of representing this more compactly. Even as I ask this question I realise there would be unnecessary difficulty in matching up the notes when sight reading, but still I'd like to hear any suggestions you have. 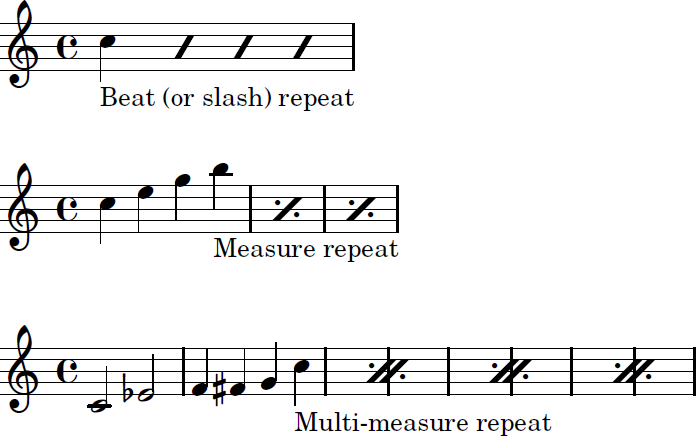 Also see this for more examples and details on repetition in music notation. You could write it on three staves, with an instruction on one staff saying "Play first time" and an instruction on another staff saying "Play second time". In some pieces, for instance Liszt's "Mephisto Waltz", at some points you will see three staves, one of them labeled "ossia", meaning "play this one if the other one is too difficult for you" (or sometimes "play this one if the other one is too easy for you"). I can't vouch for how easy to read it might be in this particular case (your alignment idea sounds promising), but there is a 'normal' way to notate repeated sections like this. Dot Slash Slash Dot, centered in the measure. If more than one measure is being repeated, you indicate the extent of it with a thick line extending from the symbol to roughly the beginning and ending of the desired measures, with thick end-caps. If it continues for more than one stave, the absence of an end-cap will serve as a cue and you can repeat the symbol (in parens) hovering over the thick line on subsequent staves. You should write the number of measures being repeated next to the symbol if it's more than one. And if it's very long, you can provide a countdown next to the reminder symbols. This is common in Band Music. If it's a rhythmic figure, you can give it a name (fig.1, riff A, pattern alpha, etc.) either in-line when it first happens or in a side-bar and refer to it by name when needed. This is common in Guitar transcriptions. If it's more than a repeated one or two-bar riff (which Bar Repeats will take care of) write it out. You're giving the player problems just to save a little bit of space. Is there any algorithmic way to split a piano MIDI into left and right hand parts?